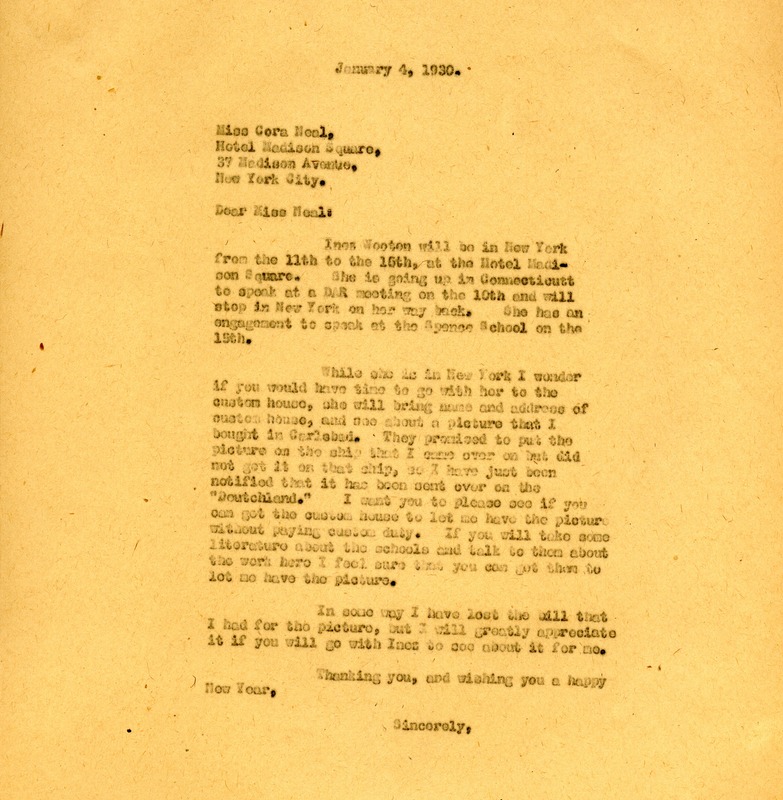 Martha Berry requests of Miss Neal that she accompany Mr. Wooten to the custom house in New York in order to recover a picture that she bought on a trip to Carlsbad. The picture is being held at the custom house because it was sent on a different ship than the one Berry returned on. Though Berry lost the will stating her ownership of the picture, she is confident that if Miss Neal talks about the work being done at the Schools, the custom house will relinquish the picture. Miss Martha Berry, “Letter to Cora Neal from Martha Berry.” Martha Berry Digital Archive. Eds. Schlitz, Stephanie A., Rachel Renaud, Daniel Warner, Chelsea Risley, et al. Mount Berry: Berry College, 2014. accessed April 20, 2019, https://mbda.berry.edu/items/show/13537.